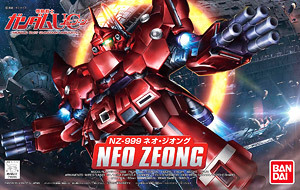 - Nemesis Neo Zeong the largest fastest kit series final chapter than [Mobile Suit Gundam UC episode7]! - This size, even side by side with the BB Senshi of standard size! · In comparison with Full Armor Unicorn Gundam, overwhelmingly large size of approximately 2 times! Bazooka Add New armed is also included in addition to the armed part of the pedestal part, "Sinanju body" that can adjust the angle!